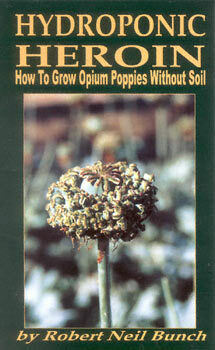 So you think you can't grow opium poppies because you don't have a patch of dirt in the middle of nowhere? Poppycock. The Babylonians used this method in their Hanging Gardens, as did the ancient Chinese, Aztecs and Mayans in their celebrated floating gardens. Now, author Robert Bunch reveals their secrets to year-round indoor growing without dirt--for the same price you'd pay for an ounce of fine marijuana! You've already taken the first step into the world of hydroponic growing just by picking up this book. Now, with just a little water and a few easily obtained start-up items, you're on your way to becoming an opium farmer in your own home.